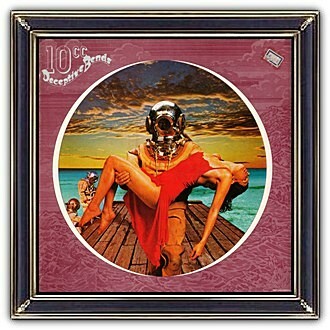 The front cover of Deceptive Bends, created by Hipgnosis, depicts an enigmatic scene in high-focus, with beautiful lighting: a diver on the jetty, holding a beautiful red dressed girl against a dramatic sky background. For the original photoshoot the combined weight of the diving suit and the girl, proved too heavy for the person in the suit to stay in position long enough to take the required shots. A frame was made to support the arms of the diver. This had to be removed in the retouching. the diver and girl, the jetty and two divers, the sea, the sky. The back cover of Deceptive Bends also started as a four part shoot, which consisted of the two band members, the diver and the sky. These elements were stripped together by Hipgnosis in a sort of 'job is done'-theme. Deceptive Bends is a beautiful example of Hipgnosis' approach to album design: strongly photography-oriented and pioneering the use of many innovative visual and packaging techniques. In particular, Thorgerson & Powell's surreal, elaborately manipulated photos (utilizing darkroom tricks, multiple exposures, airbrush retouching and mechanical cut-and-paste techniques) were a film-based forerunner of what we now call 'photoshopping'. 10cc are an English rock band founded in Stockport who achieved their greatest commercial success in the 1970s. The band initially consisted of four musicians – Graham Gouldman, Eric Stewart, Kevin Godley, and Lol Creme. 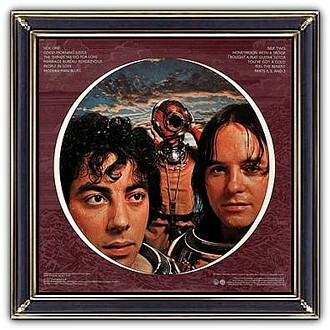 They had written and recorded together for some three years, before assuming the name 10cc in 1972. 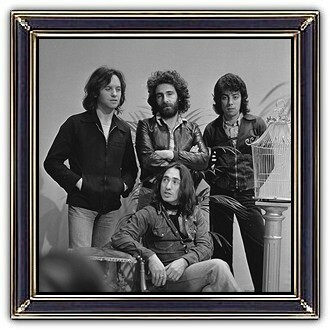 10cc Featured Two songwriting teams: one commercial (Stewart and Gouldman) and one artistic (Godley and Creme). They also frequently switched partners. Every member was a multi-instrumentalist, singer, writer and producer. After Godley and Creme left the band in 1976, Gouldman and Stewart were the main creative forces behind 10cc. Stewart left the band after 1995 and Gouldman continues to lead a touring version of 10cc.